It’s no secret that the system for commercial ad sales we had up until now was created in a way that was the easiest for us. 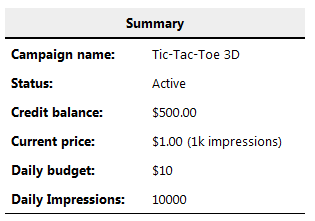 You had to buy preset packages of ad impressions for preset running periods and your purchased credits were campaign specific. We recognized the problem but were reluctant to dedicate our limited resources to address a problem that is seemingly unrelated to our core mission – free app cross promotion. But as time went by it became apparent that it was affecting our cross promotion users too and was limiting our ability to introduce new and improved features and incentives. So we changed it to what should make way more sense and allow us to improve this area and introduce new related features. One of them coming as soon as next week and it’s targeted at cross-promotion while depending on the ad sales system. So from now on your advertising credits are assigned to your account (not a particular campaign) and you (not we) decide how fast to spend them. We’ve started reworking the system with what we thought would be the most flexible approach – letting you control the duration and velocity of the campaign from multiple different angles. 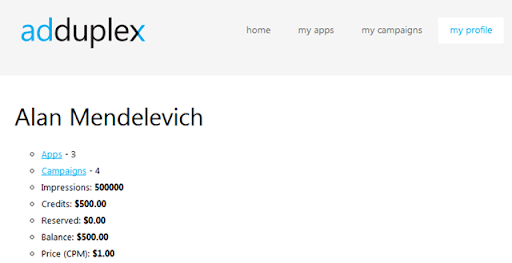 After the system was almost ready for launch it became apparent that the flexibility comes with a huge penalty of complexity, so we scraped most of it and started over. We forced ourselves to answer a simple question: what is the ONE most important and logical parameter for the users to control the flow of a campaign? We’ve considered different metrics and came to conclusion that for someone paying for advertising the one most important parameter is daily budget and that’s what we’ve left as a core setting for the campaign. So now you have your account balance and you can set how fast you want to spend it by setting daily budgets on individual campaigns. We recognize that in some cases it’s important to control the start and end dates of the campaign so this is the only “advanced” setting left. All of the currently active campaigns were converted to the new system preserving the velocity your campaigns had in the old one. The only difference is that you can control that parameter now and you can even spend the budget you bought for one campaign on your other campaigns. Do you think going simple was a right decision? Let us know in the comments. And if you see any bugs or issues in the new system, please, let us know. Thank you!